I LOVE this splash page. 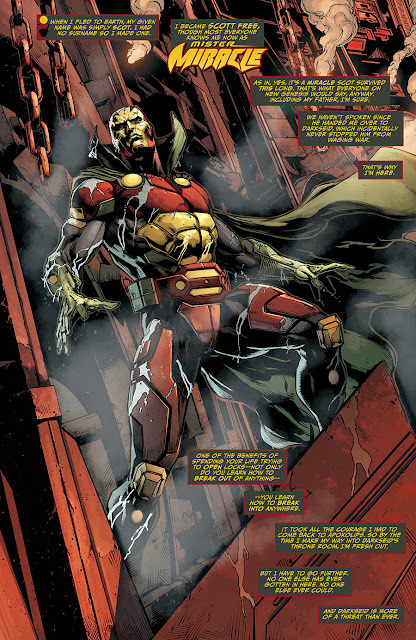 The unlettered version has been my wallpaper for weeks, when I can't see it I can see my DC Direct Mr Miracle figure, my Instagram handle is Scott Free based, and I even drew the universe's ultimate escape artist here. Jack Kirby's The New Gods are simply one of my favourite concepts in all of comics, not just DC, so seeing Scott in such a well drawn splash-page (thanks Jason Fabok), kicking of The Darkseid War in Justice League, makes me a pretty happy chappy. Especially when I read that he's just broken into Darkseid's throne room (tee hee hee) that line won't flush with some people. damn that is a well illustrated page! i also like the updated look for MM he's never looked so cool. the Red Tornado is another character that is in need of an updated look i like the character but he was visually always an eye sore to me. Not a bad redesign. Fabok is a hell of an artist in the same vain as Ivan Reis. Thanks guys - I think jason has a strong Phil Jimenez influence Dale - his work is so stunning to look at. Red Tornado - nice call Dave, now there's a face who I don't think popped up at all during the DC52? -He's NEVER looked better!!! ...and he's always looked awesome! Consider me PUMPED!